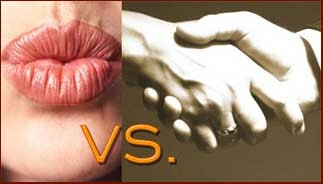 A kiss is healthier than a Handshake! A firm handshake may feel more British, but a Continental kiss is healthier for you. People who greet each other with handshakes are much more likely to pass on germs such as flu, cold and stomach bugs, than those who settle for a peck on the cheek, a scientific study has concluded. More than three million Britons called in sick last week as flu and norovirus outbreaks swept through the country. The majority will have been infected after touching someone else's hands and might have been better off kissing friends and relatives instead. "The hands are critical in the chain of infection as they transmit infections from surfaces to people and between people," said Prof Sally Bloomfield, from the London School of Hygiene and chairman of the International Scientific Forum on Home Hygiene, which carried out the research on hand hygiene. "Shaking hands is the main form of physical contact with each other but you don't know what the other person has been touching before you greet them. People avoid kissing each other when they have a cold, but in fact they are more likely to pass on an infection by shaking someone's hand." Prof John Oxford, Britain's leading flu expert and a virologist at Barts hospital and the London School of Medicine, said social kissing might help cut infections: "Social kissing on the cheek would not easily transfer infection while viruses can spread via the hands far more easily." Both experts insist that the French "air kiss", which avoids contact all together, is best. Liz Brewer, a social etiquette expert on ITV's Ladette to Lady, says a single air kiss next to a friend's cheek was the most acceptable for the British: "It is important to go for the right cheek, as that way you are greeting each other heart to heart... If you go for the other cheek it is less friendly." She says the air kiss is best for people you don't know well as there's no contact - but for the very confident there is the two-cheek option. Swine flue prevention is a matter of 'hand hygiene'!